With the cortical projections to the superior colliculus, this account of primate brain specializations comes full circle. The SC, an ancient structure involved in the control of eye, head, and forelimb movements through its descending projections, is also the linchpin of the highly derived forebrain systems of primates involved in visuospatial attention and vision for action. As we have seen, the SC is in a critical position to influence a wide array of cortical areas by means of its ascending projections to the multiple thalamic nuclei, and to be influenced in turn by the dense projections that arise from cerebral cortex. What influences might the superior colliculus have upon cortical activity? There could be several different effects, given that separate projection systems to the thalamus arise from the superficial and the intermediate/deep layers of the SC. One possibility, as Casagrande (1994) suggests with reference to V1, is that projections to the blobs arising from the superficial layers of the SC (relayed by the K layers of the LGN), serve to modulate the activity of V1 neurons over a restricted portion of visual space. This would constitute a local attentional "spotlight." Another important role of the SC might be to provide information to the cortex about the current direction of the eyes and head or about impending changes in gaze direction. It has long been recognized that the visual receptive fields of some cortical neurons exhibit "gaze effects": that is, the responses of neurons to visual stimulation reflect not only where the stimulus falls on the retina but also the position of the eyes in the orbits (i.e., the direction of gaze). Gaze effects have been most extensively investigated in posterior parietal cortex (Andersen and Mountcastle, 1983; Andersen et al., 1993). However, it is now clear they are present in many additional areas, including V1, multiple extrastriate visual areas, premotor areas PMD and PMV, and FEF (Boussaoud and Bremmer, 1999). In studies of premotor neurons, Jouffrais and Boussaoud (1999) have demonstrated interactions between retinotopic location of visual stimulation, direction of gaze, and the direction of an instructed forelimb movement. 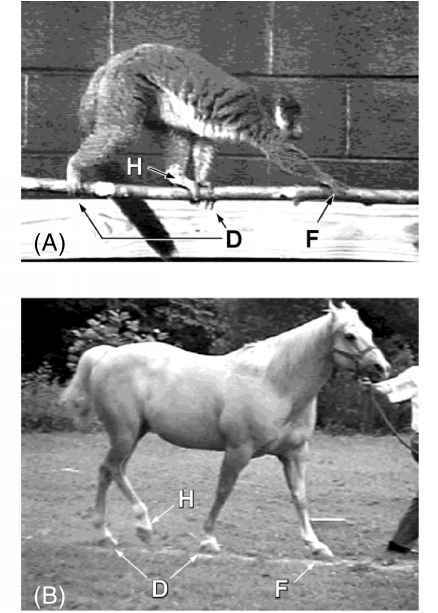 Gaze effects are believed to reflect the physiological processes by which the original retino-topic mapping are recoded into head-centered and body-centered coordinate systems, the latter being considered more suitable for programming forelimb movements. The intermediate and deep layers of the SC, where neurons that respond in relation to eye and head movements are concentrated, would likely be the source of gaze-related information to the thalamus, and thence to the cortex. How might cortical activity influence the superior colliculus? Again, there could be several different influences, depending on which collicular layers are targeted by particular cortical areas. Projections from certain low-order visual areas terminate in the superficial layers of the SC, which could influence the activity of the area V1 blobs through collicular projections to the K layers of the LGN. It may be significant, too, that primates possess a strong projection from FEF and posterior parietal cortex onto the superficial SC layers, which could conceivably modulate the activity of neurons in V1 blobs. Projections to the intermediate and deep layers of the SC, which arise from a much larger portion of the cortex, could influence the activity of collicular neurons that project to brainstem and spinal centers controlling eye, head, and forelimb movements. In this context, we also need to consider how the visual field specializations of the primate superior colliculus relate to function. Recall that primates are distinctive among mammals in having a collicular representation restricted to the contralateral hemifield, but comprised of nearly equal inputs from both eyes. This suggests that binocular interactions are particularly important in primate SC functioning, perhaps in relation to tracking target distance or to monitoring the location of the hand as it moves toward a target. Reaching accuracy is known to depend critically on visual feedback about the location of the hand as it moves in depth from the periphery toward a foveated stimulus (Jeannerod, 1988).